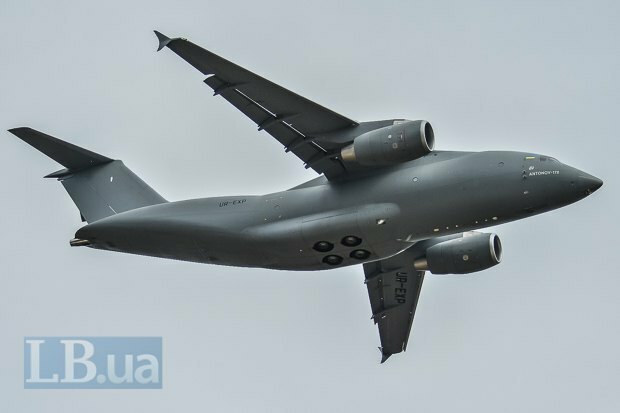 New Ukrainian plane, the AN-132 freighter made her maiden flight on Friday, 31 March, an LB.ua journalist reported from Kyiv airport in Svyatoshino. An-132D (demo) aircraft was developed on the request of Saudi Arabia. Its carrying capacity is 9.2 tons, its length is 24.5 m, height 8.8 m, wingspan 29.2 m.
Antonov has signed a memorandum on the intention to jointly produce 80 An-132 aircraft for Saudi Arabia. The aircraft will be partly produced in Ukraine, like the prototype at Antonov, while Saudi Arabia builds the capacity for own production of this aircraft and components in the kingdom. The intellectual property of the aircraft is divided equally between the two sides. The cost of the aircraft has not yet been disclosed. The decision on whether there will be a firm contract for 80 aircraft will be signed will be taken after the delivery of the first sample. An-132 is the first Antonov's aircraft assembled without Russian components. The aircraft is designed for flights on close- and medium-haul routes, and will be able to perform a wide range of transportation tasks. It will have a cruising speed of 500 km/h and maximum cruising altitude of 9,000 m with a maximum load of 9.2 tons.